On Sunday at our church, the entire service centered around the crisis in Haiti. Our pastor spent much of last week on the ground in Haiti, visiting the Hands and Feet Project, an orphanage in Jacmel that our church supports. We watched a few videos that were taken this week as the tragedy of January 12 and the many aftershocks are still so raw. One video showed a small group of Haitian Christians huddled in a room that had not yet crumbled, and they sang out, "I am not forgotten. God knows my name." It was such a powerful moment, and Mark Stuart (one of the orphanage's founders) said he believes that one reason God allowed the earthquake is to remind the world of the plight of this hurting nation. God has never forgotten Haiti, but the world has. And now the global spotlight is on them - they are being rescued, clothed, fed, and prayed for by people in every continent. At times, the tragedy seems very real and really shakes me. At other times, I flip off the TV and get back to my (often petty) to-do list. But when I see images on the screen that are difficult to fathom, I try to put myself in their shoes. What if I was the one who mourned for her husband as she just found out he was buried alive in the rubble? What if my house had crumbled and we were left without food, water, or shelter? Why not me? I am quick to realize that everything I have been given - literally everything - is a gift from God. My money is not my own. My home is not my own. So even though Haiti is seemingly so removed from my life here, I feel that I have a responsibility to at least ask myself this question: "What is my part in the restoration of Haiti?" I believe each of us should ask ourselves that question. No, I don't think everyone is called to make a trip there. In fact, I think very few people should go as it's been emphasized over and over that unqualified people - even with good hearts - will only add another mouth to feed. But I believe that to whom much is given, much is required. And we have been given so much. Maybe your part is to pray. I am often guilty of thinking prayer is not enough, when in reality, there is nothing more powerful we can do than plead with the Creator of the universe on Haiti's behalf. We can pray for peace, for restoration, for hope. 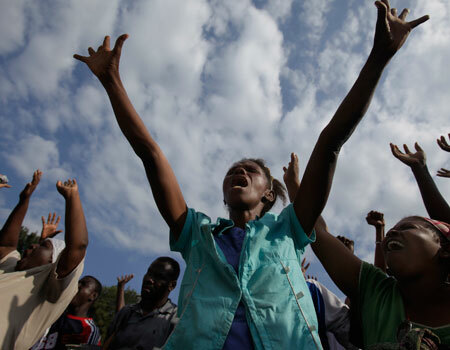 Most of all, we can pray that the thick darkness that has bound Haiti for so many years would dispel in Jesus' name and revival would envelop this country! What an incredible picture of redemption that would be - and not too big for God! He holds Haiti in the palm of his hands. I really don't know what else I am called to do. I may donate another round of jewelry to World Vision. Maybe we'll adopt. I really don't know. But I am "wrestling in the tension" (as our pastor would say) that here I sit in Franklin, Tennessee with everyone of my needs met while our brothers and sisters in Haiti have nothing. I sit here sipping a cup of tea, thankful that I have electricity, running water, more clothes than I would ever need, clean air to breathe, and I have never once gone hungry. My brothers and sisters in Haiti cannot say the same right now. So right now, I pray. The following passage from Isaiah 54 was written for Israel, but it is such a stunning prayer for Haiti right now. I hope you'll join me. not my covenant of peace be removed,"
and great will be your children's peace."